Call 800-BUY-KWIK right now for a "KWIK" cash offer within 24 hrs or less!! Any Condition, Any Reason, Anywhere! We will Buy your house. 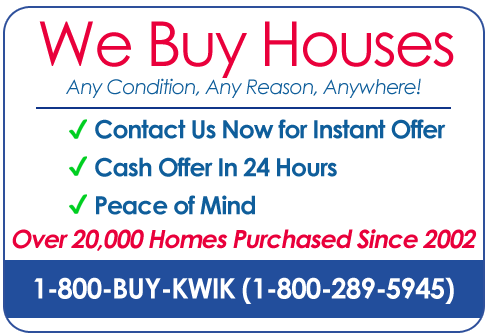 At 800-BUY-KWIK Sell your house in 4 easy steps! 800-BUY-KWIK made us a cash offer on the day we called them and we had our cash in just a few days! Thanks 800-BUY-KWIK for being there when we needed you. Sell My House Fast – We Buy Houses for Cash! Looking for a Cash for Houses solution? We at 800-BUY-KWIK take pride in creating Win-Win situations. Our goal is to provide Fast Real Estate Relief to our customers by making you a cash offer in 24 hours or less. We buy houses throughout the United States in any area and any condition. No commissions, no hidden fees, and best of all no repairs. Selling a house can seem like a daunting ordeal. However, when you sell a house for cash to us, you won’t have to deal with pushy real estate agents, hassle with banks, or even wait around for paperwork to go through. Call 1-800-BUY-KWIK and one of our representatives will get your home information, or fill out the Fast Sale Offer Form on this page. We’re available 24/7 to help you. A local buyer will contact you within 24 hours to make a cash offer on your home. Accept the cash offer on your as is house and choose a closing date that works well for you. Celebrate! Your home selling process will be over in just a few short weeks. 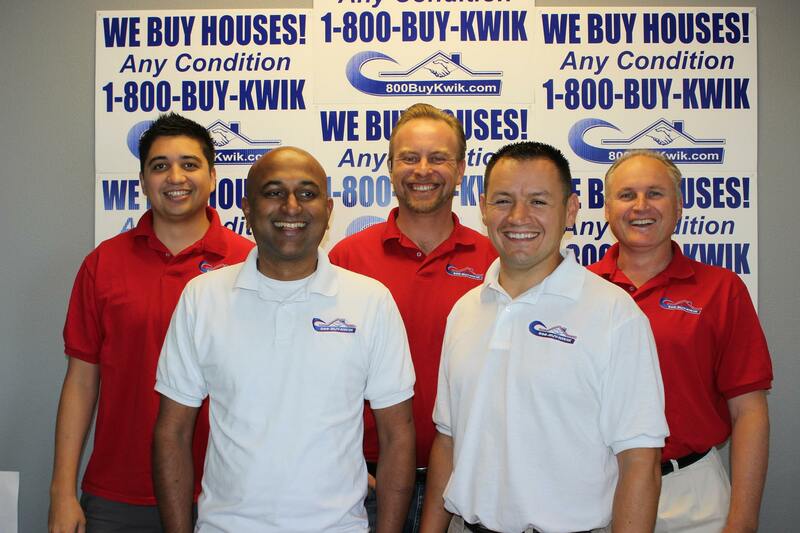 At 800-BUY-KWIK we know that there are many reasons why you need to sell your home for cash. That’s why at 800-BUY-KWIK, we make Cash Offers in 24 hours or less so you can sell your house now and move on with your life. Submit your information on the form or pick up the phone and call your local 800-BUY-KWIK representative. Don’t delay any longer. Our sell my house fast property investors will help you move on with life and turn that burden into a Payday. We make Cash Offers in 24 hours or less so you can sell your house as-is now. Are you selling a house as-is in? Need to sell your house fast? Then contact us today to get your 100% FREE, no-obligation CASH offer on your home. We GUARANTEE a cash offer in a little as 24 hours. Get the solution you need. We help people who need to sell a home as is. Most transactions are completed in as little as 5 days. Is it really possible to sell my house for cash? We make fast cash offers on your home by utilizing our network of cash investors. No gimmicks. No pushy real estate agents. We are cash buyers looking for homes. This means that you won’t have to hassle with real estate agents, bank loans, or cutting through all the red tape. We simply make an offer and you accept the cash for your house. The process is seriously FAST and SIMPLE. Fill-out our short form and we’ll make you a cash offer in 24 hours. If you decide that you want to sell your home fast, we’ll buy it–and we’ll handle the entire process. Get in touch with our home buyers for fast results. No pushy sales person. No we buy houses gimmicks designed to get you to turn over your keys. We’re real investors ready to give you a fair cash offer on your home. When you sell us your house as is, you’ll get cash in your hand within 5 days of the offer. We buy houses throughout the United States. Sell My House Fast — in Any Condition? Does your home need extensive repairs, cleaning, and maintenance? No problem. Our home buyers purchase properties in any condition. If you have a home that needs major repairs (cosmetic or worse), we can often make a fair cash offer to help you sell your house fast without the hassle of making repairs. No matter the condition, no matter the area, we buy houses as is. There are many reasons why people choose to sell a house as is for cash. Problems such as foreclosure, high-payments, extensive repairs and more, can be a massive financial drain on you and your family.